Beautiful unissued certificate from the R. A. Rowan & Co. printed in 1905. This historic document was printed by Stolt & Thayer Co. Los Angeles and has an ornate border around it with the company's name on top center. 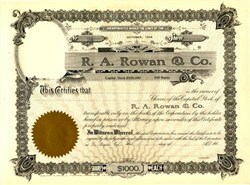 Robert A. Rowan formed a real estate firm, R. A. Rowan & Co. at the age of thirty in 1904. Rowan was apparently the first Los Angeles developer to exploit the potential of a financial practice previously unused in Southern California. The ingenious technique involved establishing a separate corporation for each new building venture, then transferring the construction site to the corporate entity, in exchange for the capital stock. The company then sold long-term mortgage bonds to pay for the construction of the building. When Robert A. Rowan unexpectedly died just thirteen years later, his company was one of Los Angeles, largest enterprises, having developed much of the city's downtown business center and raised half a dozen skyscrapers. R. A. Rowan & Co. built the grand Alexandria Hotel, the Los Angeles Athletic Club, the Rosslyn Hotel and a number of other historic Spring Street buildings. Rowan also initiated a unique residential development and called it Windsor Square. The "Square" ran from Wilshire Blvd. to Third Street, and from Irving Blvd. to Plymouth Blvd. This constituted a private square in which the property owners would own the streets as well as their homes. Deed restrictions set a minimum cost of $12,550. on each home to be built, in order to assure handsome homes in an exceptionally beautiful setting. At that time there were dense groves of bamboo in the area which needed to be destroyed before trees and gardens could be cultivated. Intervening walls or fences were discouraged so that one garden ran into another creating a park-like setting. Windsor Square was the first area in the city to have the power lines below grade, an extraordinary innovation for 1911.